Madre Chocolate has won again at the Big Island Chocolate Festival to add to its growing suite of awards, this time bringing home the best bean-to-bar chocolate award in a competitive field for a 70 percent dark chocolate bar crafted with cacao sourced from the Likao Kula Farm, Holualoa, Kona. This award, which Madre has won for three years running, was judged by chocolate luminaries “Mr. Chocolate” Jacques Torres of the Chocolate Haven and former executive pastry chef at Le Cirque, chef Donald Wressell of Guittard, chef Vincent Bourdin of Valrhona USA, and chef Stanton Ho of Amoretti. David Elliott and Nat Bletter, cofounders of Madre Chocolate, were ecstatic at the news of the win, and credit much of the chocolate’s exceptional flavor to the hard work of the cacao grower, Gini Choobua, with whom they have collaborated over the last few years to perfect a post-harvest fermentation technique that highlights exquisite gooseberry and brazil nut notes in the cacao her farm produces. Choobua’s farm is located at 1600 ft. – extremely high altitude for cacao production. The cold nighttime temperatures at this altitude are considered by many to be an obstacle to producing premium quality cacao, but Choobua has combined innovative techniques and careful study to defy the odds and produce incomparable cacao with a beautiful complexity of flavor. And the cool temperatures at this latitude and altitude do give the cacao a highly desirable quality: it produces an exceedingly creamy chocolate with an incredibly luscious texture due to the unique qualities of the natural cocoa butter found in the high altitude cacao beans. 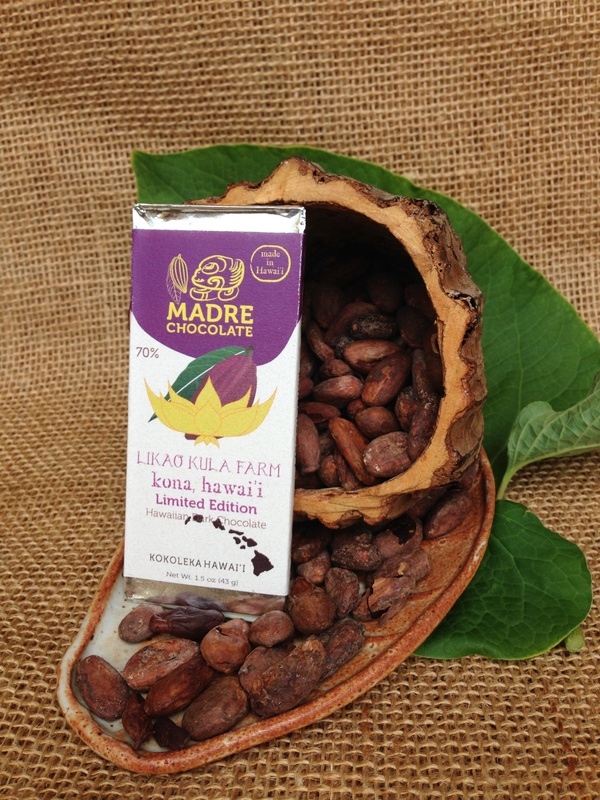 “We’ve been fortunate to win national and international awards that help bring recognition for the world-class cacao and chocolate that’s now being produced in Hawaii,” said the company’s “Chocolate Flavormeister” Nat Bletter. Madre strives to connect chocophiles with the roots of chocolate, leading a variety of delightful chocolate events on a weekly basis, from cacao farm and chocolate factory tours to bean-to-bar chocolate making classes, whiskey and chocolate pairings, traditional mole-making classes, and an intensive cacao boot camp aimed at training a new generation of chocolate makers. This is what makes Madre Chocolate one of the only U.S. grown chocolates that is exported around the world for everyone to enjoy. This entry was posted in News and tagged awards, bigisland, festival. Bookmark the permalink.